These cupcakes are like music to your ears…er, taste buds. 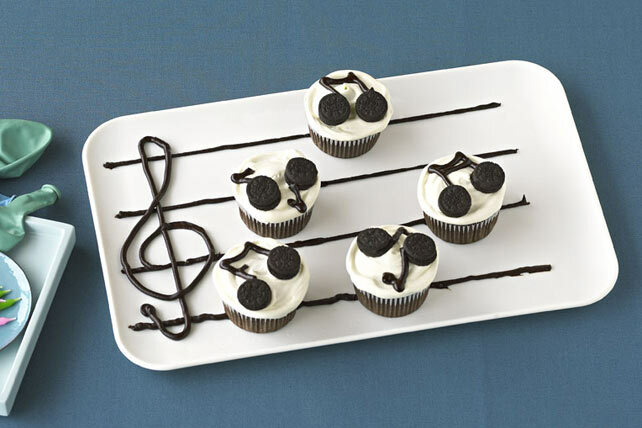 Music lovers will have fun decorating (and eating) these cute chocolate cupcakes. Frost cupcakes with COOL WHIP. Top each with 2 cookies for the music notes. Pour chocolate into resealable plastic bag. Cut off 1 small corner from bottom of bag. Squeeze chocolate from bag to add stems of music notes. Keep refrigerated. Melt 3 oz. additional BAKER'S Semi-Sweet Chocolate; pour into resealable plastic bag. Cut off 1 bottom corner of bag. Use to draw horizontal lines on white serving platter to resemble a music staff. Add a treble or base cleff sign at left end of staff. Arrange decorated cupcakes on staff just before serving.